This week I am sharing a set of photography links shared to me by my Circles on Google+. 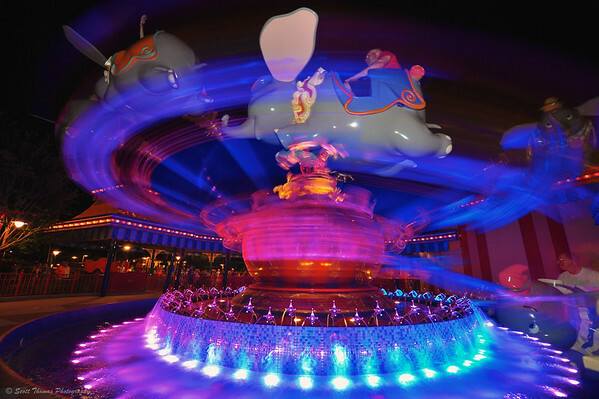 Dumbo ride in Storybook Circus. Its new home in the Magic Kingdom. Nikon D700/Tokina 11-16mm, 1s, f/8, ISO 200, EV 0, 15mm focal length, tripod. Above is an example of a long exposure photograph taken at night. Do you know how to take really long exposures in the middle of the day? Learn how in this five minute video by Scott Kelby. Here is a link to the 10-Stop Neutral Density filter he used in the tutorial. I do not agree with all of them but here are Fifty (yes I said 50) Quick Photography Tips in Less Than 15 Minutes. They will make you shake your head in every direction and give you lots of ideas. Worth every minute of your time. Like Kathy mentioned this week, let us explore the flip side: 17 Things Photographers Should Not Do. A few are directed towards full time photographers. Just ignore those which do not pertain to your current stage of photography. The last one is a general tip for all of us. The story was making the rounds on the Internet this week but bares repeating: How Apple and Amazon Security Flaws Led to My Epic Hacking. This entry was posted in Photography and tagged blur, florida, google plus, inspiration, magic kingdom, motion, night, nikon D700, online, orlando, scott kelby, security, tips, tokina 11-16mm, tripod, walt disney world. Bookmark the permalink. lol, Scott, I had to click on “what Kathy mentioned this week” because she’s been writing so much. It is good to remember those things we photographers should not do, as well as the things we should do. 🙂 Thank you! Fantastic, Just got my 10 stop ND filter last week. Thanks for mentioning the 17 things. I appreciate it. You’re welcome, Rosh! Happy to share.